A classic clawfoot bathtub is a timeless design in many bathrooms, but leaving it on an island in the middle of your washroom won't let it reach its true potential. According to Better Homes and Gardens, using bathroom accessories to your advantage can help to make this stunning piece a focal point of your space. Placement of your shower curtain is extremely important when decorating an area around an antique bathtub, so consider hanging them near the ceiling for dramatic effect. A curved shower curtain bar over the top of the tub will draw the eye toward your ceiling and help make the room feel much larger. Use a standard plastic curtain on the interior while using a curtain liner on the outside to infuse the room with a bit of color. Always use washable curtain liners that can be switched out to hail the change of the seasons and keep them in tip-top shape throughout the year. 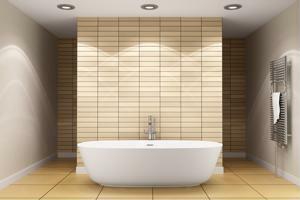 This can be one of the easiest fixes in your bathroom and it can revitalize the look of your space. How can a shower curtain change the look of your washroom?